This beautiful South Shore nightstand upgrades your bedroom with top-notch style and elegance. Bring even more style into your home with this beautiful contemporary piece. This useful nightstand can provide you with ample storage and display space for all of your bedtime necessities. Perfect for any contemporary bedroom, this Prepac nightstand is a great combination of style and durability. With a contemporary look, this piece delivers the style and practicality you need. This handy nightstand is perfect for placing an alarm clock, storing books, or holding a bedside lamp. Perfect for any contemporary bedroom, this Prepac nightstand is a great combination of style and durability. With a gorgeous modern design, this piece is sure to be a stylish addition to your home. Hold a bedside lamp, store your books, or even place an alarm clock on this handy nightstand. You'll find this attractive nightstand from our Avilla collection very handy! It features 2 storage drawers, as well as an open space for your books, reading glasses, tablets, and other accessories. And the charm of the piece lies in the grooves on its drawer fronts and mouldings on three sides! You'll go crazy for its cottage style! With its contemporary kick plate and its moulding on both sides of the drawers, this nightstand from the Fusion collection will help you create a trendy and peaceful bedroom. Its rich gray oak finish goes perfectly with the sleek, contemporary appearance of this piece, creating something original that will give your dicor a superb effect. You'll also find its many storage spaces are ideal for keeping your room organized. Gloria 22-inch x 23.25-inch x 17-inch 2-Drawer Nightstand in Brown This beautiful South Shore nightstand upgrades your bedroom with top-notch style and elegance. Bring even more style into your home with this beautiful contemporary piece. This useful nightstand can provide you with ample storage and display space for all of your bedtime necessities. 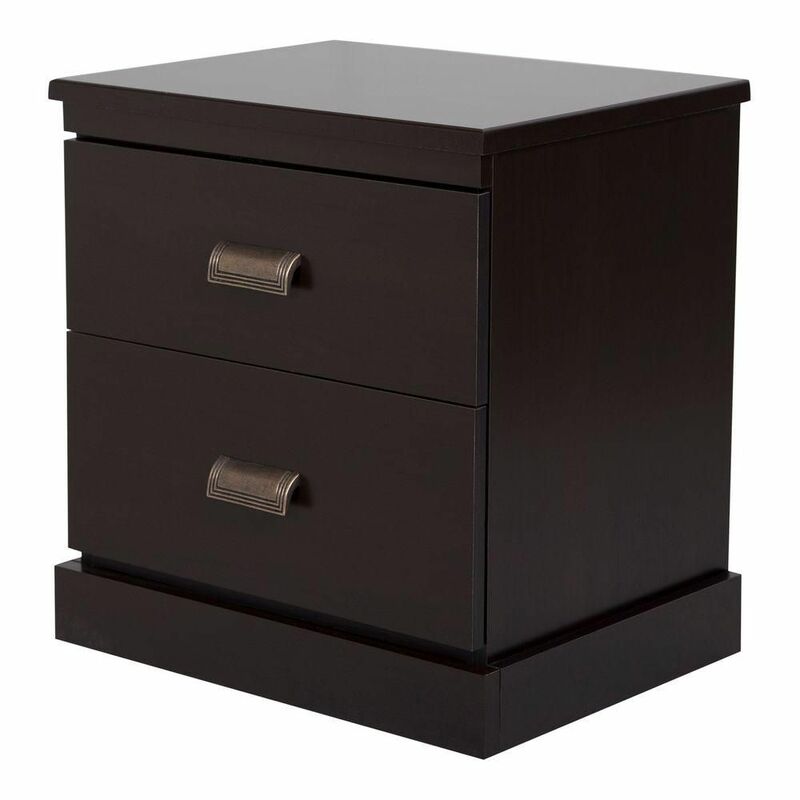 Gloria 22-inch x 23.25-inch x 17-inch 2-Drawer Nightstand in Brown is rated 3.0 out of 5 by 3. Rated 1 out of 5 by Ladyfl19 from This product looks great but is poorly made. I haven't had it for one month and the inside botto... This product looks great but is poorly made. I haven't had it for one month and the inside bottom has come apart from the door. Rated 4 out of 5 by AP from Nice size and easy to assemble I purchased several pieces from this collection and this is my favorite. It is sturdy, looks great and is the perfect size. One of the drawer pieces was missing a groove for assembling the bottom of the drawer so I called for a replacement. A new piece was sent quickly and arrived in good condition. It's not the highest quality piece but I hope it holds up over the years.